Salvia spathacea, a variety of sage in the genus Salvia, is also called hummingbird sage because hummingbirds find its red blossoms attractive. For this reason, it is a beneficial plant to the ecosystem, and while it grows wild, it can also be purchased from a nursery and planted in your yard or used for wilderness site restoration. Salvia spathacea is a perennial herb that is a dicot, a plant that has two emergent leaves or cotyledons. It is a native plant of California. It spreads out by a system of rhizomes and therefore is considered a groundcover plant. It has leaves ranging from 3 to 8 inches in length and purple or magenta colored flowers on 1- to 3-foot stalks that bloom during the later winter months or in the spring. 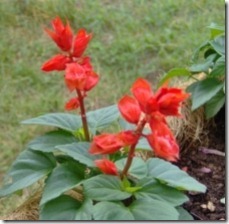 Salvia spathacea is found in warm tropical or subtropical regions in North and South America. Within California, it can be found along the Pacific coast from as far north as Sacramento and south past San Diego. It does not grow well too far inland because it needs somewhat moist soil. Salvia spathacea thrives in chaparral, oak woodlands and coastal scrub habitats. These habitats provide a suitable environment with enough rainfall, from 26 to over 150 inches per year, with full to partial sun. The Salvia spathacea is somewhat tolerant of drought conditions, but it can be stressed under extreme drought. With Salvia spathacea’s evergreen foliage, it makes a good native plant that will stay green all year round. It grows particularly well underneath the shade of oak trees. To add scent to your garden or landscape, plant S. spathacea in sunny areas or beneath windows so the fragrance from the flowers will fill the air. Salvia spathacea does not require very much attention if it is planted in its natural habitat where it is adapted to the environment. Provided that the soil is kept moderately moist, it will thrive. It will require trimming to keep it neat and under control. It is easily infected with powdery mildew if planted in full shade without any sunlight. Insects like slugs, caterpillars and slugs can also damage the leaves.